Beginning October 1, I noticed multiple issues on the English Wikipedia mobile site. None of the issues were present the day before. The text Search Wikipedia is gone from the search box. Also gone are the search suggestions. On all the pages which can be added to my watchlist, the stars which can be clicked on to add those pages to the watchlist are gone. The edit links are gone. The day I noticed the issues (October 1) I cleared my browser's cache and cookies, but the issues still persist. I had not updated my browser or changed any of its settings between the time I last used English Wikipedia (September 30) and when I noticed the issues (October 1). I edit English Wikipedia from my Samsung Galaxy S6, which runs version 5.1.1 of Android Lollipop. The web browser I use is Google Chrome, its version is 45.0.2454.94. Jesant13 raised the priority of this task from to Needs Triage. Jesant13 added a subscriber: Jesant13. After submitting this report and mentioning I had done so at Wikipedia:Village pump (technical), I went to the MediaWiki site and discovered that the same search box issues are present. Yet when I was logged out of MediaWiki prior to creating this report, the issues weren't present. This means the issues are with MediaWiki, not just English Wikipedia which confirms my suspicion that they originated with the most recent update. 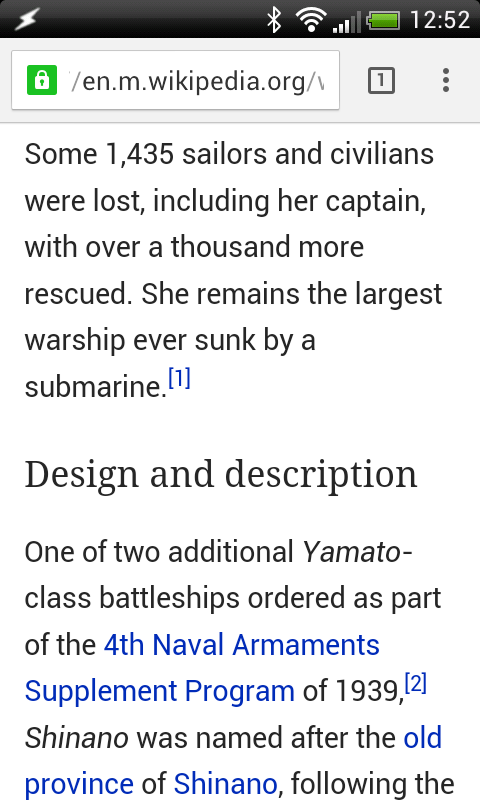 Korea Wikipedia mobile version has same problem. Chrome (and other WebKit browsers such as Naked Browser), as well as Opera, are unaffected for me, but Firefox (version 41 on Android 5.1, Motorola Moto X) exhibits this behaviour. Microsoft Internet explorer has same problem. Chrome, and Safari has same problem too. I don't know if that's possible to do through Google Chrome on Android. I looked around but didn't see an option. Update: Chrome and Naked Browser are now broken too. I guess I had old styles and scripts cached or something. Firefox is affected and has remote debugging support. Possibly related to T114622 ? I am still unable to replicate this :( :(. If anyone is tech savvy could they debug this and see if any errors are reported in the developer console to shed light on this issue? • Jdlrobson merged a task: T114622: Investigate reports of broken section toggling. The only thing I can think of is this is caused by T99096. @Krinkle is there some way we can rule this out? Would simply touching the static resources force a cache flush? I'm not able to replicate either. Tested on Chrome and Firefox on Linux. I think i've just replicated this and am debugging. Anyone who is experiencing this issue - can you answer me a question? Were you still able to interact with the menu icon in the top left corner? Did clicking that work without loading an entire new page? This is returning error for me. When I wrapped the offending code in a try/catch the bug went away https://gerrit.wikimedia.org/r/244094 and subsequent code ran. So my current theory... I looked at other uses of mw.track and it seems we do some sampling with it... if this explain why some users are seeing this bug and some are not. @bmansurov and @phuedx can you see if there is anything we're sampling on enwiki (maybe that needs to be turned on to kick in) that might be breaking experience for some of our users and not easily reproducable? When I debugged a little more it turned out there was an error in QuickSurveys. Did you raise a bug? I'd love to see what error that was. I left a comment on your patch. I think I'll be able to help debug the issue once I can replicate locally. Seems my theory was correct.. now just need to work out why..
@HairyDude I just confirmed it's fixed for me. Can you verify the same? @Jdlrobson Wikipedia does indeed work again. Thanks! As a side effect, I'm also seeing seeing usage hints and the first image repeated at the top of the page, and search suggestions are also showing wikidata descriptions - I've seen some of these before but none immediately before the breakage iirc. @HairyDude, you must be in the beta mode if you see wikidata descriptions in search results. @Tfinc @Deskana @ fyi I suspect this will have damaged traffic to the MobileWebSearch schema in the past week in case you noticed any blips or unusual behaviour (I don't monitor this data). Anyone in that bucket of users who clicked a search result would have set up a search beacon to log the event. This code was broken, so for any pages visited after that search would no longer work. This is what caused the bug to be very difficult to debug. Now in dev environments/browser tests we will turn off sampling for all devs to make it easier for us to surface these bugs. • Jdlrobson added subscribers: Ainali, Josve05a. Have had confirmation in various places that this is now fixed. Will keep hanging around before sign off to make sure we covered everyone. @Jdlrobson, section headers still aren't collapsing for me. Chrome 42.0.2311.111 on HTC Desire S running Android 4.0.4. It's an older device; I haven't been able to find a working driver for debugging. @Paul_012... this is most strange. I did a little bit more debugging and can't see any reason why this would still be a problem. There was a deployment yesterday afternoon, after your post, did that improve things for you?